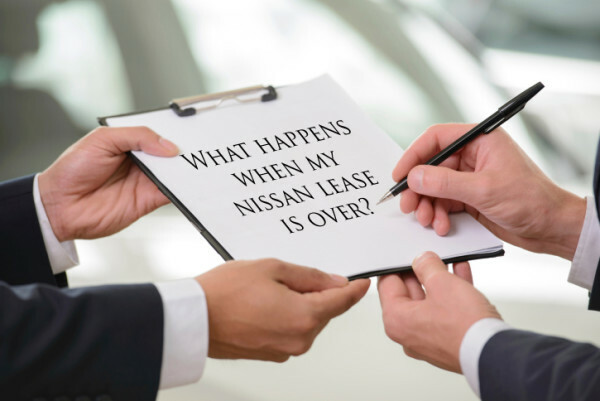 What Happens When My Nissan Lease Is Over? Very often at the dealership we have customers who are approaching the end of their lease and aren’t really sure what their options are, especially if it’s a new driver or if it’s the customer’s first time leasing a vehicle. We’re here to tell you that there are actually several options for Nissan customers approaching the end of their lease. In order to take advantage of these incentives, check out this form. You should also know that before your lease expires, it will need to be inspected. But we’re not talking about the tear-your-hair-out DMV-type of inspection. Before your lease expires, contact the Nissan Lease Customer Network at (800) 778-4211 to set up a complimentary vehicle inspection. This inspection may help you avoid a wear-and-use charge for items that may be covered by your insurance policy (such as a damaged windshield). And it will help you decide what to do with your leased vehicle. This inspection takes approximately 30 minutes, and can be done at your local Nissan dealership, your home, or your place of business. It will be performed using a laptop computer, and the results will be printed immediately after the inspection. The inspector will review the report with you and address your questions. You will be given a copy of the condition report. A second copy will be left in your vehicle, and should remain in the vehicle until the time of return. One thing to keep in mind if you decide to buy your leased car is that the car’s interest rate could be higher than the interest rate of a new car. This is because your leased car is technically a used car and used cars generally have higher interest rates. Here’s a tip: If you think at the end of your lease you might buy the car, before you sign a lease, you can always ask your salesperson what the estimated buyout price or resale value of the car might be to help you determine the best financial approach for you. Return your Nissan. At the end of your lease, you always have the option of returning the leased vehicle and taking no further action towards buying a car or leasing a car. This is very rarely the case, however, as in this day and age the majority of people need a car! If for whatever reason you do decide you will not be getting a replacement car, there are a few things to wrap up. You will need to schedule an appointment with you local dealership to come in and return the vehicle and fill out any exit paperwork Federal Odometer/Lease Termination Statement and the Vehicle Condition Report. You will also want to call the Nissan Lease Customer Network to report the return of the vehicle. Typically, before your lease is approaching its expiration, your local Nissan will contact you to remind you about the approaching end-of-lease date as well as to help you decide what your next move will be. If you’ve never leased a car, we hope this post serves as a heads-up of what to expect in the end, but also, you can check out a previous blog post we’ve written on the benefits of leasing a vehicle. No matter if you buy or lease with us at Tischer Auto, we simply want to help our customers make the most informed decision as possible. If you have other questions about leasing, feel free to leave a comment below or reach out to us on Facebook or Twitter. This entry was posted in Nissan News and tagged lease a Nissan, leasing benefits, leasing vs buying, Nissan, Nissan cars by Tischer Acura Nissan. Bookmark the permalink.